States that have taken steps to legalize marijuana have, largely, reaped the economic rewards that followed. But in Oregon, it may not be that easy. 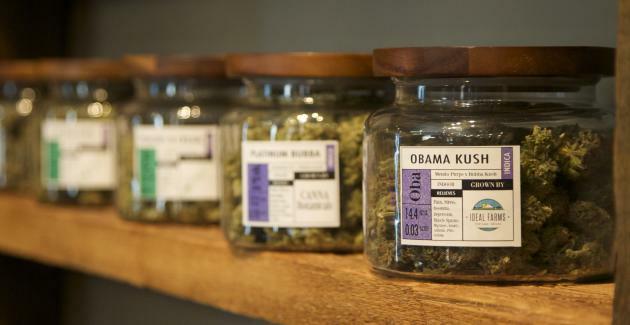 Oregon on Thursday became the third U.S. state to legalize sales of recreational marijuana. Oregonians can now buy up to one-quarter ounce of marijuana from any of about 200 medical marijuana dispensaries across the state, but legal marijuana may not be as big of a boon to Oregon as it has been in other states. Oregon’s northern neighbor Washington sold $50 million worth of marijuana last month alone. In Colorado, the first U.S. state to legalize recreational marijuana sales, purchases topped $700 million last year. It's impossible to predict just how much marijuana Oregon will sell in the coming months, but cannabis entrepreneurs in the medical marijuana business — which has been legal since 1998 —have been struggling. “For the last year, medical has not done very well. It’s been more of a charity or a nonprofit,” said Nicholas Saulsberry, who owns Meg's Marijuana in Springfield, Ore.
Saulsberry, who also is president of the Oregon Cannabis Retailers Association, came to Oregon hoping to make it big in the legal marijuana business. He’s poured about $400,000 — profits from day trading — into his business, but a year in, business has been sluggish. Saulsberry is not alone. Struggling dispensary owners like Saulsberry are one of the reasons Oregon decided to launch recreational marijuana sales ahead of the finalization of rules that will eventually govern cannabis sales. Regular, taxed sales of recreational marijuana aren't scheduled to begin until January 2016. And despite the long lines and excited crowds that greeted many cannabis dispensary owners on Thursday the road ahead is likely to be tough. For starters, Oregon businesses won’t be allowed to sell edibles —among the most popular legal cannabis products — until next year when permanent rules for cannabis sales are set to be adopted. In Colorado, edibles make up almost half of all legal marijuana sales. Oregon has the cheapest weed in the country, with the average ounce going for about $240, according to PriceOfWeed.com, a site that anonymously crowdsources cannabis pricing data. A separate study in the Humboldt Journal of Social Relations puts the figure even lower, estimating it to be $177 an ounce. Ample supply has held prices down, and one report from the Seattle-based investment group Privateer Holdings suggested Oregon has enough marijuana to supply not only its own residents but also cannabis consumers in Washington, Colorado and Arizona. Oregon has one of the highest rates of marijuana usage in the country, but a lot of people grow their own. Oregon has 72,517 registered medical marijuana patients. It has 46,292 registered growers and produces mutiple times more than the state's population can consume. In Oregon, licensing application fees are low, and there are no rescritions on the number of licenses that will be made available for producers, processors or retailers, making it one of the easiest places in the U.S. to break into the legal marijuana business. That's one of the things that attracted Saulsberry to Oregon, and he knows he's not alone. “I do expect competition to be pretty fierce especially with a lot of deep pocketed out of state money,” he said. New Frontier Financial Group, a Washington, D.C.-based marijuana data firm, is expecting Oregon’s marijuana market to nearly double in size by 2020, when the firm estimates it will do about $464 million in sales. That’s still smaller than the legal marijuana market in Colorado and Washington, but isn't surprising, considering Oregon has a smaller population than both those states. “It's going to become very competitive very quickly,” said John Kagia, New Frontier's director of industry analytics. That may be good for bargain-hunting consumers, but revenue-hungry retailers may not fare as well. "I don’t expect every store to survive," Saulsberry said. Still, he's hopeful. Hours before closing on Thursday, his store had seen more than 300 customers and racked up more than $15,000 in sales. "I know there's a lot of excitement, and I hope with good business practices, that we can keep this going." Meena Thiruvengadam writes about the legal marijuana business for Yahoo Finance. Follow her blog on tumblr at amsterdamamerica.tumblr.com and follow her on Twitter at @Meena_Thiru. Subscription boxes are all the rage, but will they catch on for legal pot?